we are leading suppliers & exporters of "Febuxostat Tablets" in China, Russia, Hongkong, Bulgaria, Romania, India. Online Suppliers Feburic 40Mg Tablets Exporters Price India-Russia-China, Modern Times Helpline Pharma are the leading suppliers, exporters, dealers of Feburic tablets at very cheapest and reasonable price in Delhi-India. We are leading suppliers & exporters of Feburic 40Mg Tablets, Feburic 20Mg Tablet, Feburic 60Mg Tablet, in China, Russia, Hongkong, Bulgaria, Romania, India. We are largest suppliers of Ajanta Pharmaceuticals medicines & provide you the best price on Feburic 40Mg Tablets, Zurig 80Mg Tablet. Feburic Tablet is used for High Blood Uric Acid, Painful Joint Conditions and other conditions. Feburic Tablet contains Febuxostat as an active ingredient. Feburic Tablet works by reducing the serum uric acid. Febuxostat, sold under the brand name Feburic among others, is a medication used in the treatment of chronic gout and hyperuricemia. It inhibits xanthine oxidase, thus reducing production of uric acid in the body. Dosage Instruction - As per your doctor / medical practitioner / health consult / nurse / hospital / health care adviser. Warning: Feburic medicine out of the reach and sight of children and away from pets, never share your medicines with others, and use this medication only for the indication prescribed. The information contained herein is not intended to cover all possible uses, directions, precautions, warnings, drug interactions, allergic reactions, or adverse effects. Guidance and Advice: Feburic medicine is a prescription drug and should be used under proper medical guidance and advice. Do not share this medicine with others, since they may be suffering from a problem that is not effectively treated by this drug. Description - The Brand name of this medicine is Zurig . 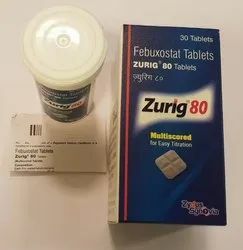 Zurig medicine contains generic Febuxostat. 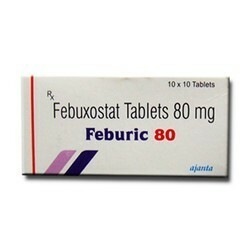 Febuxostat are available in form of Tablets. Each Coated Tablet contains 80 Mg. One Pack of Zurig contains 28 Tablets. Manufacturer & Marketed company name of Zurig is Zydus Synovia, India. USED - Zurig 80 MG Tablet is an antigout agent which is used to prevent gout attacks by reducing the uric acid production. 5. Used – It is used used to prevent gout attacks by reducing the uric acid production. Warning: Zurig medicine out of the reach and sight of children and away from pets, never share your medicines with others, and use this medication only for the indication prescribed. The information contained herein is not intended to cover all possible uses, directions, precautions, warnings, drug interactions, allergic reactions, or adverse effects. Buy Online Flomist nasal spray 10ml Cipla Price India-Russia-China, Modern Times Helpline Pharma are the leading suppliers, exporters, dealers of Flomist tablets 10Ml at very cheapest and reasonable price in Delhi-India. We are leading suppliers & exporters of Flomist tablets 10Ml in China, Russia, Hongkong, Bulgaria, Romania, India. We are largest suppliers of Cipla Pharmaceuticals medicines & provide you the best price on Flomist 40Mg. 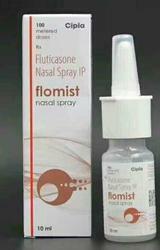 Flomist Nasal Spray is used for Stuffy/runny nose, Seasonal and year-round allergic, Pruritic manifestations of corticosteroid-responsive dermatoses, Itching and sneezing, Inflammatory manifestations of corticosteroid-responsive dermatoses and other conditions. Lenalid medicine out of the reach and sight of children and away from pets, never share your medicines with others, and use this medication only for the indication prescribed. The information contained herein is not intended to cover all possible uses, directions, precautions, warnings, drug interactions, allergic reactions, or adverse effects.